Dancing on your toes is for belly dancers too. How Can You Dance in Those High Heels? Even if you are a beginner, you should start using *releve (rul- luh- vay) in your Warmup so you’ll be strong enough when you want to dance while lifted up on the ball of the foot. The reason that beginners don’t dance up on their toes is because they don’t have enough body control to stay balanced; and they also dance at a slower pace. When they gain enough body control to dance quickly, they will need to get up off their heels. So begin working on your releve now, it will become easier over time. In the beginning, some students have a hard time actually getting into full releve simply because they just never go up on their toes, and never wear high heels. If there’s one thing that high-heeled shoes are good for, it does get your foot used to the “releve” position (but you know high heels are bad for your feet and back so only wear them for short periods of time!). Sometimes they do this because of inattention, but sometimes their foot isn't flexible enough yet. Because I’ve learned that this half-way position isn’t good for the foot, I always urge a higher lift. You need to bring your weight UP (over the ball) of the foot, imagining that you’re wearing very high-heeled shoes. Yes, I’m a Pisces, very focused on the feet! How Do You Wear High Heels While Dancing? See how the body weight is brought up over the toes in the photos of full releve? 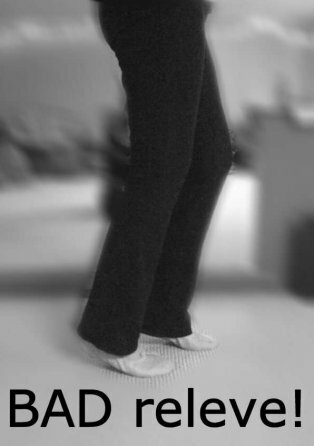 You can balance well in this position once you get your heel lifted high enough. This explains how dancers can wear high-heeled shoes while dancing: it’s because they’re not carrying much weight in their heels, where it would be unstable - but are actually carrying their weight over the ball of the foot. Mystery solved! You’ll find this position becomes more comfortable the more you use it, and in fact many steps are much easier when you keep your heels lifted - walking shimmies, and shimmies layered onto foot patterns are often easier in releve. When the pace quickens and we dance faster, our steps have to become smaller. The less foot there is on the ground, the easier it is to step quickly. Do You Use Releve in Belly Dancing? Always remember to “get high” when you do releve - don’t just go half-way! What did you think of this in-depth series of articles on our belly dancing feet? So often we only think of what’s happening between our knees and neck! But our foundation and CONNECTION to the earth is through our feet; and until we have wings, we must work to master our movements through space by using our weight, through momentum and contact with the ground. Let me know if you found this series of articles on foot positions in belly dancing helpful - did you learn anything knew? Did this information clear up your questions or lead to more? Let me know by email or comments! 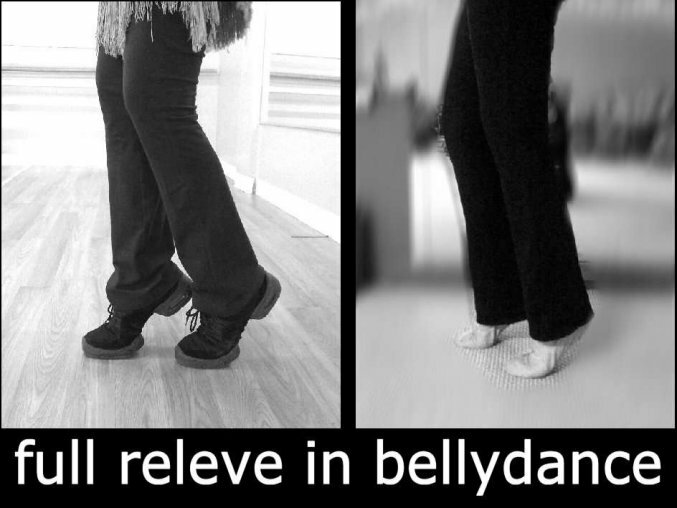 *”releve” actually involves a plie (bend of the knees) before or after, but since we are almost always using softly bent knees in belly dancing, I simply use “releve” for anytime we are lifted onto the ball of the foot. In ballet this would be “eleve” (meaning no plie involved).